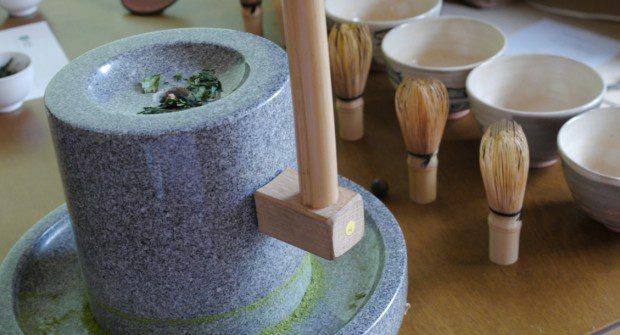 Bright, grassy, bursting with umami, a little astringent, and all with the hit of a double espresso… Matcha is the traditional Japanese stone-ground green tea powder, and forms the central part of the Japanese tea ceremony – Chanoyu. The history of Matcha stretches back to the year 1191, when the Zen Buddhist Monk, Eisai, brought powdered tea to Japan from China. 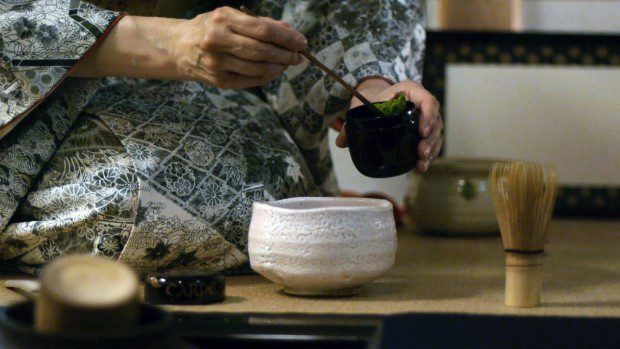 From here, the practice of Matcha drinking was embraced by the Shogunate, and spread through Japan’s Buddhist Monasteries, becoming closely aligned with Zen Buddhism, where the ceremony was honed over generations to take the form that we recognise today. Ceremonial grade Matcha goes through a quite incredible process to take it from leaf to powder, which begins before the leaves have even been picked. In the last few weeks before the tea bushes are ready for harvesting – between 2 and 6 – the tea growers will cover the bushes, shading the plants from around 60% of the sunlight. In response, the tea plants work double-time to reach up to the light, producing higher amounts of chlorophyll and amino acid L-theanine than your usual tea. 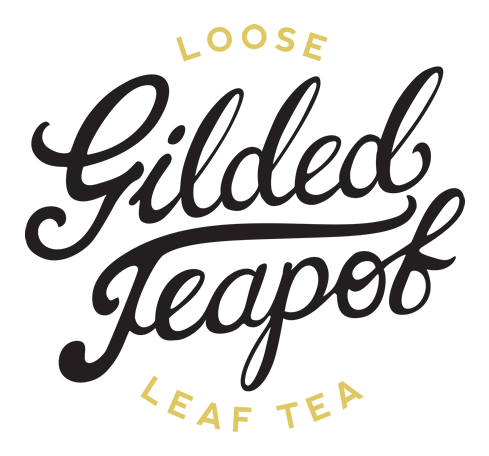 The finest, most tender leaves and buds of these are plucked when the time is right, and the leaves continue on to be processed. Normally these leaves would be rolled at the beginning of their process, but leaves destined for Matcha are let to dry flat (Tencha) where the purest part of the leaf from between the vein and the stalk is removed, and ground in specialised granite mills to produce the iconic green Matcha powder. In essence, there are two different kinds of Matcha: ceremonial and culinary. 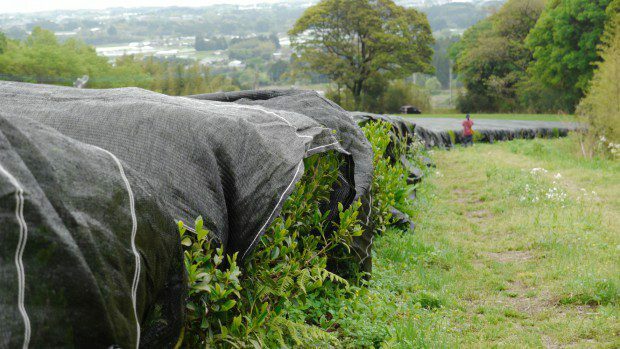 Shaded tea bushes waiting to become Matcha in Miyazaki, southern Japan. Matcha has become a bit of a celebrity lately in the field of health, and it is certainly with very good reason.  When you enjoy Matcha, you are drinking the whole leaf, rather than an infusion from it as with normal tea leaves – this makes it naturally high in minerals and vitamins, especially A, C and E, and up to 100 times more antioxidants than your usual cuppa. Add into that its amino acids and beta carotene, and you soon have a bowl of tea that will pack quite a punch. How can I make it at home? Water between 65-75 degrees C. If you’re in a hard water area, use spring water instead, as Matcha struggles to foam in your usual tap water. Take one scoop of the sieved Matcha powder (approx 1/2 a teaspoon) using the Chashaku, and place it in the bottom of the bowl. Pour on the water to fill the bowl to a little over a third. Then, take your Matcha whisk in hand and gently stir the powder in the bowl. Make your action faster and faster in a ‘W’ shape, slowly lifting the whisk until a satisfying foam appears on the surface. Your Matcha is ready. 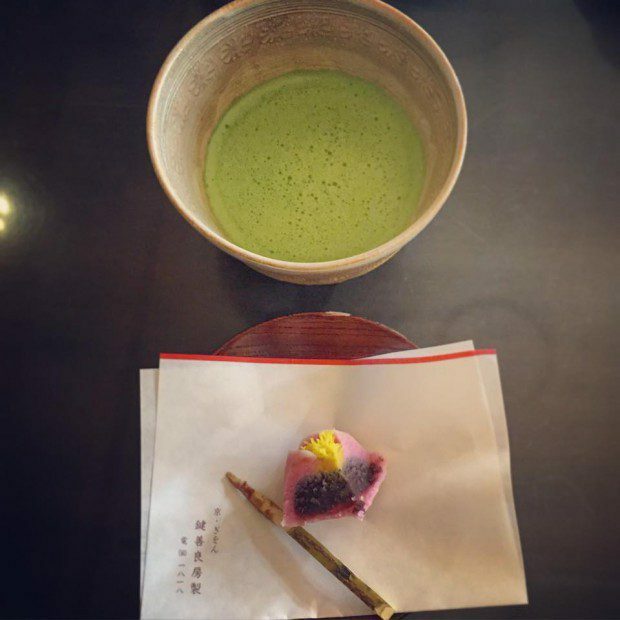 Bowl of Matcha and traditional Namagashi in Kagizen Yoshifusa, Gion. A 200 year old tea and wagashi specialist. While a daily ceremony of your own can be absolutely wonderful, there are other ways that you can enjoy your Matcha, too. Being a powder it can have many uses, so go ahead and get a little creative… Why not use it in a Matcha Latte, stir it into your morning juice, or make some Matcha ice cream? While Japan is the home of the tea ceremony, you’ll see it everywhere there in Pocky sticks, sweets, patisserie, Kit Kats… even Oreos! Help! My Matcha is clumpy! Aaah, relax! This is perfectly normal – Matcha powder will naturally clump together when it comes into contact with the air. 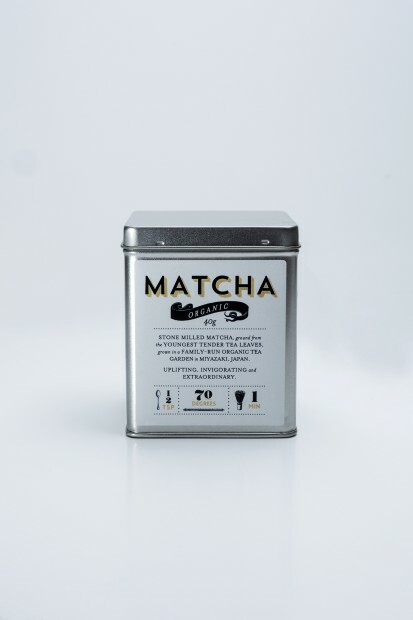 Simply sieve your Matcha before using for a good, even infusion. Should I store my Matcha in the fridge? Yes and no. Yes, if you can guarantee that it is stored in a completely air tight package away from fridge condensation and strong smells (like cheese, for instance). Otherwise, the back of a cool, dark cupboard will be ideal. How can I make my Matcha foam? If your Matcha feels a little lifeless, don’t worry. First, be sure that you’re using a high grade – then, check your water. If you’re using hard tap water or mineral water, you probably won’t have much luck developing a good foam. Use bottled spring water heated between 65 – 75 degrees C. And when you’re whisking, really go for it. Why can’t I use boiling water on Matcha? Matcha’s Goldilocks zone is between 65 and 75 degrees C. Adding very hot water will bring out bitter compounds in the tea – while we are looking for some bitterness in Matcha, we also want to appreciate the full depth of flavour that it has to offer, so anything too hot will simply obliterate this complexity. So I can make iced Matcha?